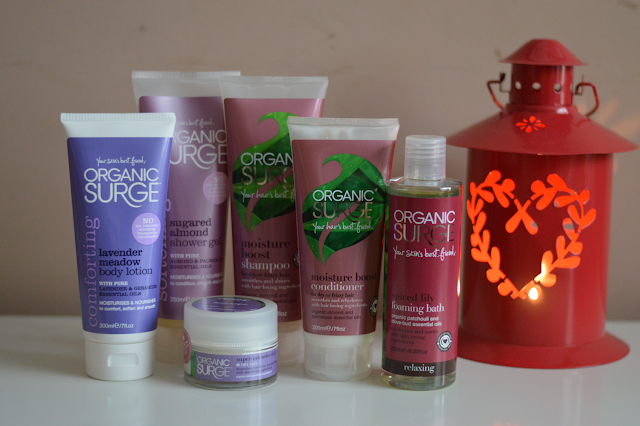 Today I have a medley of products to share with you all by the brand Organic Surge, I've mentioned the brand before on here. This is the Nature's Winter Wonders Bundle and boy oh boy is it a bundle, there's haircare, skincare and bodycare. Winter is still very much here and I don't know about you but the dark early evenings and dark mornings aren't exactly invigorating are they? They just make you feel sluggish. These are all full sized products! The bundle is priced at a very purse friendly £29.95, not bad for top-to-toe beauty. Organic Surge products are 100% free from chemicals, including parabens, sodium lauryl sulphate and artificial fragrances and colourants. My top picks from bundle is the Spiced Lily Foaming Bath, this smells so good. Just what you want at the end of a busy day or the end of the week! The magic of essentials oils help your body and mind to de-stress, patchouli and spicy clove-bud work very well together as a scent. 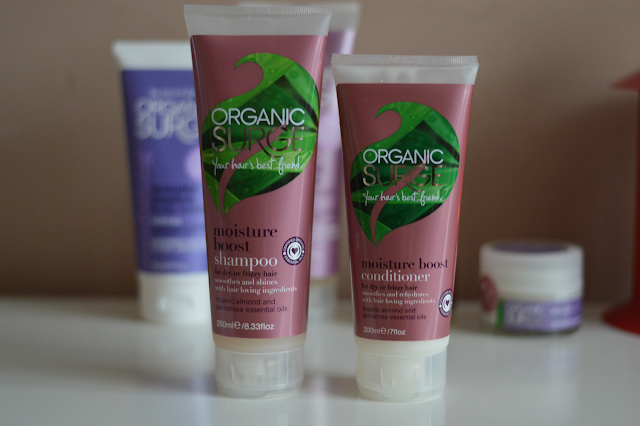 The other two products which have made an impression in my routine is the Moisture Boost Shampoo and Conditioner. They work hand in hand and smell so nice, a really nice soft subtle almond and vanilla scent. The Moisture Boost range does exactly what it says- helps hair to stay moisturised and boosts hair with extra moisture where needed. The conditioner isn't heavy and doesn't weigh hair down, I find some conditioners can be a little too much for the hair and take forever to rinse through. This duo would be great for dry or frizzy hair. Organic Surge has another amazing deal which is too good to miss. Have a sneak peek here at the Mega Bundle 10 products worth £60 but you can snap them all up for only £24 pounds! A great way of trying a variety of products from the brand. You could also spilt them up and share them with friends and family, all chip in together! What are your Winter Wonders? Please share your skincare, hair care or body care treats! Ohh sounds fab! I will have to keep a look out for that one! Wow! The mega bundle sounds great. I like bundles or value packs to introduce products or brands. I just started a new blog, I would really like some feedback! Yes I think the bundles are a great way of being able to try more products from the range without spending all your wages lol!